It’s not rained for a while. Not properly anyway, meaning that dirt track walks have suddenly dried out and extra bits of the countryside have become accessible. I’ve continued my slightly ambitious walking schedule this week and maybe explored a little more than usual as a consequence. When muddy paths aren’t an issue I’m far more inclined to peek my head behind a bush and see what’s hidden down a route I’ve never walked along. Not that this has been an issue for the various companions I’ve had during the week. 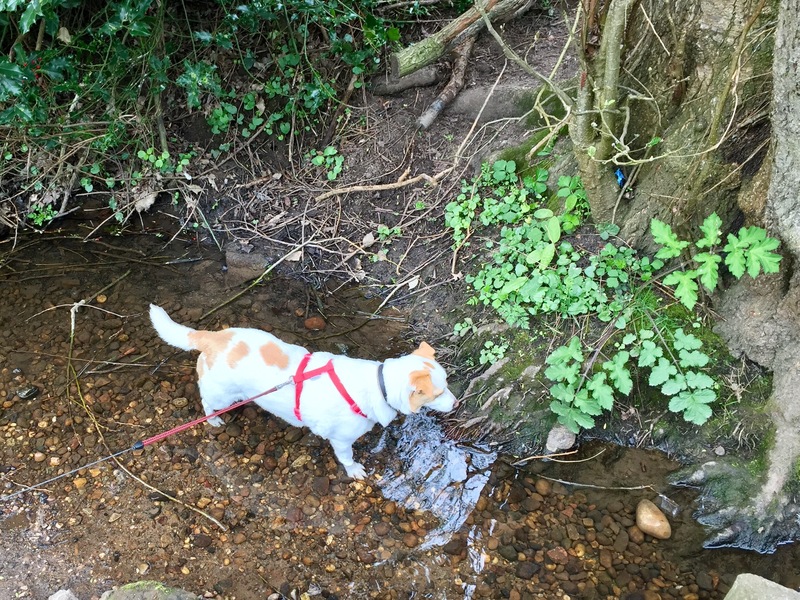 Some more than others seem to prefer wet feet – and one in particular positively revels in any opportunities to get a good soaking or a bit dirty. Freckles always brings with her an enthusiastic and relentlessly excitable charm. 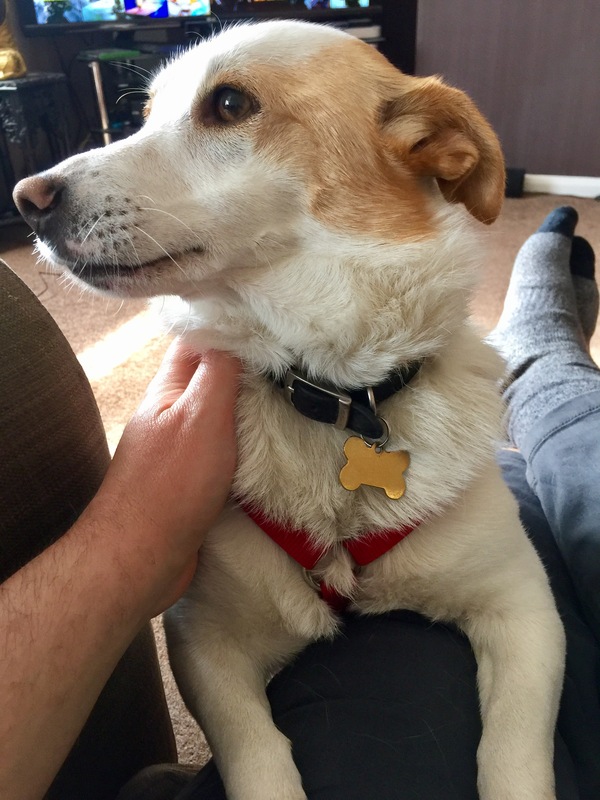 There’s rarely a moment that she ever seems anything less than insanely happy to see anyone and always wants to be fussed by you or return the compliment with a hearty hand licking session and a wagging tail. Not so long ago there was an advert on TV where a cat realised how miserable life was being a cat and decided to ‘be more dog‘. The slogan (for O2 mobiles) really caught on – and for a while it was everywhere. I too aspired to be more dog. For me that meant being more spontaneous – to live life in the moment and be happy. After all – life is too short to be miserable – right? It’s certainly the way I’ve tried to live lately. Pick myself up, move on, keep going forward, try harder all the time and create my own positivity! I’m beginning to wonder though if (rather than being the only answer to how I should live my life) this is just a part of who I need to be – and that I’ve ignored something crucial to my continued success. I’ve been reading another self help book that a friend gave me (Living like you mean it – Ronald J Frederick link) this week. It’s not one I would have picked up voluntarily – and had she not given it to me I would probably have left it sitting on its metaphorical shelf. This book has various messages (and I’ve not finished it yet) but for the most part its central theme is about letting your feelings out rather than burying them. This book had initially really irritated me. It got on my nerves because I didn’t understand why people wouldn’t want to talk about how they feel. It seems natural to me. I do it all the time. It’s something that annoys me when I find other people who are unwilling to do it. I actively seek out friends who are also willing to do so. I doubt many would label me as someone that has a problem with saying how he feels – or letting others know about it – and in many respects I could probably now be accused instead of telling too many people. As with most things in life though it’s folly to think you have the answer to anything. Just as soon as you think you’ve cracked it then something pops up and reminds you that the only thing you know for sure is that you don’t know everything. In my case (as I quietly turned the pages of this well loved and scribbled upon book) I thought something that made me pause. I realised – I’m not letting myself feel down. Now don’t get me wrong – I can naval gaze as well as anyone and vocalise when things affect me negatively. I’m self aware enough to see mood dips coming a long way off and because of this I often move quickly to close gaps, circle the wagons and manage dark moods before they become an issue. I go for walks to get it out of my system, divert the bad thoughts by meeting friends and do something that will make me feel positive. However – for the first time over the last couple of days I’ve begun to wonder if my overriding personal mantra (‘there is no way to happiness – happiness is the way’) may occasionally have unintended consequences. What I was reading has made me think that maybe he logical side of me – the part that I like to think is in control and at the wheel – actually makes next to no decisions without my emotions. I suspect that most of us would struggle to say what makes us truly like one thing or dislike another. Often it’s just ‘a feeling’. These subtextual complex motivations (often formed unconsciously throughout our lives) inform almost everything we do and every choice we make – yet how often do we give emotions the credit they’re due, and truly let them out? Not very often I’d argue. After all – that way is the way of anarchy right? We continually instead strive to be grown up and in control – to put away childish feelings and be responsible adults. In my case I do my level best on a daily basis to re-frame things in a positive way and find lights at the ends of tunnels. For the most part this approach serves me well. It’s been a significant driver behind my recent success and has positive benefits when it comes to friendships and relationships. Occasionally however it can (maybe paradoxically) also leave me feeling suddenly isolated. If I hit a bad patch I often feel I can’t always share it and that I should just shake it off rather than burdening the rest of the world with it. Sometimes I manage to push through my normal impulses to cover negativity up and decide to tell people how I feel – but quite a lot of the time I still keep this kind of thing to myself. No-one (I tell myself) likes a miserable person – so I should just cheer up and look on the bright side. If I don’t then I’ll just be moaning and I don’t like thinking that people will see me that way. I usually resort to ‘getting some perspective’ to accomplish a turnaround. In doing so I tell myself that there are people who have had (and continue to have) tougher lives than my own and that I should be thankful (very thankful in fact) for what I have. I pull myself together, pick myself up and move right along. In doing so though I often end up labelling these occasional negative thoughts (in myself but interestingly not in others) as unproductive or weak. Other people get on with life – so I should too. I guess in many ways I do this partially because I’m worried about what will happen if I do give myself over to such feelings. I’ve made so much progress lately – if I do will it cause me to slip back into old habits? Then all of a sudden (while going through this thought process in my mind) I realised that my vision of myself as very emotionally aware and in touch with my feelings may be a bit flawed. What if I’m prolonging the process of recovery from dark moods when I re-frame all my negative feelings and refuse to let myself feel down? The book has an interesting approach to this kind of behaviour. It suggests that bad feelings are like waves and tides. They have cycles and a natural start and end point. If you restrict them then they will spill out in other ways – but if you allow yourself temporarily to be hit by the wave, or even momentarily carried along with it then it will eventually break on the shore and you can move on. I don’t think I’ve ever really done this. When I talk about negative feelings I try to rationalise and categoriese them or explain their arrival and predict their departure. I attempt to intellectualise them rather than just give myself over to them – because if I do then where does it end? I’ll just be miserable forever and no-one will like me. What if by doing that and driving forward trying to create positivity all the time I’m prolonging something that’s completely inevitable, unavoidable and furthermore healthy? Maybe everyone from time to time (as a good friend refers to her occasional hormonal retreats) needs to ‘throw a pity party’. Fear not though internet. It’s unlikely I’m going to start dressing in black, wearing dark makeup and listening to The Cure anytime soon. However maybe next time the darkness arrives I might choose to spend my day under a duvet and getting stuck into some good old fashioned misery to see what happens. I still won’t eat all the pies though. That’s never ever going to happen again. Previous Post: Good golly it’s Molly! I would say that no-one likes an ALWAYS miserable person. If I want to have a ‘duvet day’ the problem I have is that I feel incredibly guilty for sitting around doing ‘nothing’, but in fact I think that taking time out to be a total grump and recharge my positivity batteries as important to my health as a good diet. I would love to say I always walk it like I talk it, but it’s a work in progress! Oh gosh this sounds so familiar! A while ago I started journaling in my planner in the hopes of finding out what caused my occasional mood swings. But my psychologist​ told me to let it go. And I realised she is right. Sometimes I might feel a bit down, and there might not even be a real reason for it. Everyone has this, so why can’t I accept that I do too? It’s just better to embrace the gulf and feel what you feel. It’s a heck of a lot less frustrating and confusing and as a result passes faster. So yes, I’d say: cuddle up underneath the blankets if you need to. We all have those days :). They just make you human.